Why Are Gold And The Dollar Spiking At The Same Time? Home » Why Are Gold And The Dollar Spiking At The Same Time? In an extremely rare occurrence, gold and the USD have recently been rising at the same time. Is this a sign of something ominous to come? This week, Your News to Know rounds up the hottest new stories involving finance and the gold market. Stories include: Gold signals that the markets have changed, loading up on cash and gold is the only way out of this, and a gold veteran says Brexit could be the start of a major bull market. Recently, the shocking Brexit decision caused investors to flock to safe assets like cash and gold, which has caused both to rally. Yet analyst Raoul Pal and former fund manager Grant Williams are concerned about an overlooked aspect of the parallel rally: It’s extremely rare for both the dollar and gold to spike simultaneously. The breakdown of the standard relationship between cash and gold should be a concern to everyone, and Pal blames the difficult situation in the markets for it. “This never happens… It’s a dark sign. People are forced to buy dollars because of the global carry-trade. They want to own gold because in a negative interest rate environment — if your interest in Germany is -1%, you’re better off to own gold,” he said. In a recent piece on Forbes, investor and founder of Mauldin Economics, John Mauldin, went over why gold and cash are the best assets to have. Mauldin feels that something in the markets has got to give: The currency devaluations, negative rate policies and slow economic growth are confusing even the most experienced investor and forming a bleak outlook. Mauldin believes it’s only a matter of time before investors realize that central banks are stumbling in the dark. When they do, he predicts that we will either be condemned to a sharp breakdown in the markets or a slow-rolling panic. “Either way, the price of gold will soar,” Mauldin says. Stocks are helping to illustrate current issues with the markets: The U.S. stock market is almost unprecedentedly overvalued as evidenced by the Wilshire 5000 Market Index being greater than the country’s overall GDP by over 20%. 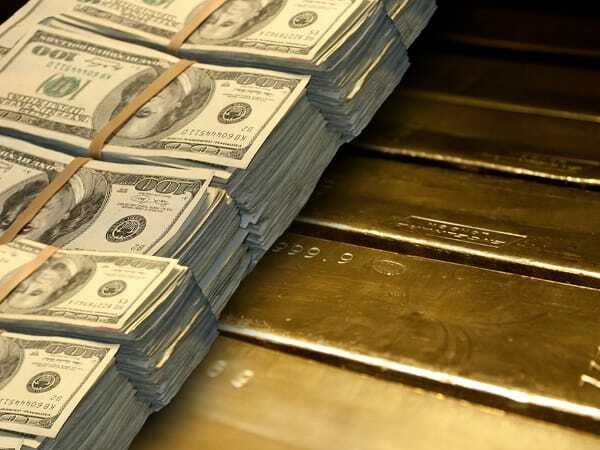 And while cash – in particular the dollar – is considered a safe and liquid asset, Mauldin explains why only gold can bring the kind of certainty needed with a greenback that could be on its way out. Despite its long-term stability and use as a currency for over 5,000 years, gold only makes up for around 1% of the average portfolio due to negative market sentiment. Once people around the world realize that central banks are out of their depth, however, Mauldin expects that the yellow metal will “certainly soar”. The recent passing of the Brexit vote helped propel the rallying yellow metal even further as gold is now up well over 20% since the start of 2016. The vote in favor helped gold storm past $1,300 an ounce, underlining predictions by major banks like Morgan Stanley and Goldman Sachs that gold will bounce 8-13% in the near term. Should you hold cash or gold? Find out here.